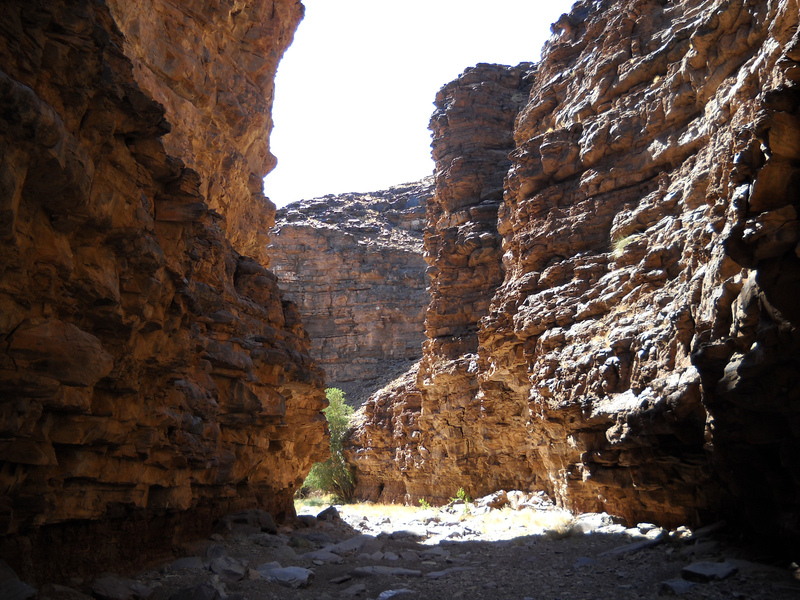 O ne day I heard about a place called Donkerkloof – a magical place that is a gateway to a very exclusive part of the Fish River Canyon. When I say exclusive it may be the wrong word, it is just that few have ever been there due to the hassle of getting there. 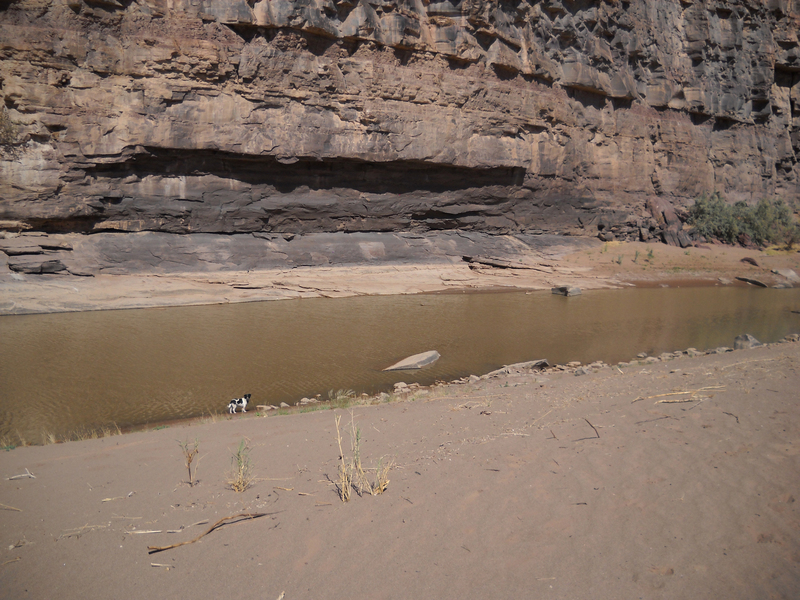 This is a part of the canyon north of where the Ai-Ais trail enters, therefore, the area remains mostly untouched. Picture that red canyon carved in the stone that our Windows screensaver often jumps to; to hear that there is a place like that right here in my home country, Namibia, was a great surprise! I had to find it! I wanted to gather information on this gem from the locals, people I met on the road and at the little abandoned (well just about) stop called Goageb. I got nothing. I just about give up hope when I found a farmer at Alte Kalköfen Lodge who mentioned it. I immediately pulled him aside and got all the details. His advice was that I take the toughest four-wheel-drive vehicle I could find and get ready for some rough terrain. I found a ’75 U1100/416 Unimog covered in dust standing in the shade of a huge prosopis tree. When I asked the farm manager about the Mog he said “It used to run some time ago”. That was all I had to go on, so I checked the dipstick and the water, replaced some fuses, “borrowed” another truck’s battery, and low and behold the beast roared. I sat for about an hour after that trying to figure out how the gears worked; quick calculation… 72 ratios, so the right arm was working hard. Oh, it had left-side steering! The foreman told me that the “Kloof” is visible from the lookout point on Vogelstrausskluft lodge. Booking a game drive that ends in a sundowner at the lookout point was easy enough but the trip there not so much. With the scenery constantly changing it’s a long but beautiful ride. It was a miserable day, overcast, rainy and cold but just as I got fed-up with the conditions the earth suddenly dropped away! It was like we had reached the end of the earth, that place where N!xau from “The Gods must be crazy” finally threw away his coke bottle. It was mesmerizing. The rain stopped, the wind stopped, a deafening silence hit me and the sun broke through the clouds shining on an area of the canyon that I then accepted to be the “Kloof”, I was just sure of it. The dog is Chester, a mutt I bought at Kanaal Sewe‘s yearly Radiothon auction a few years previously. He is supposed to be a Jack Russel-Maltese Poodle cross but I don’t think that does him justice. He was about the only company I had for the preceding eight months. That, and the solitary plains of the south of Namibia. It was Chester and myself and the millions of black rocks that lay strewn over the farm I was running in the interim time between matric and university. That dog would follow me everywhere, if I had to go into town he was at my heels. It didn’t matter what I kept myself busy with, he would be there for a quick chat or to swap thoughts about a problem. Without Chessie I don’t think I would have survived the solitude. The time to find Donkerkloof crept slowly closer. As much as I enjoy Chester’s conversational depth, I needed someone to share this experience with, someone that I knew shares my love for my country and the natural beauty it holds. I called up Sean McCulloch, (from here on referred to as Skottie) a good friend of mine. There we were, ready for this adventure. Skottie was waiting for the varsity year to end in December and I was waiting with Chester, counting the black rocks as they miraculously multiplied daily. One evening sitting at a coffee shop in Bethanie I fell into conversation with an old gent, apparently local, that said some parts of the canyon has perennial springs and that these sometimes have some fish in them. The gent added, reminiscently, that a younger version of himself even tried his hand at fly-fishing in these springs. Unfortunately, a fly-fisherman I am not and neither was Skottie, but we still added freshwater gear to our packing list. 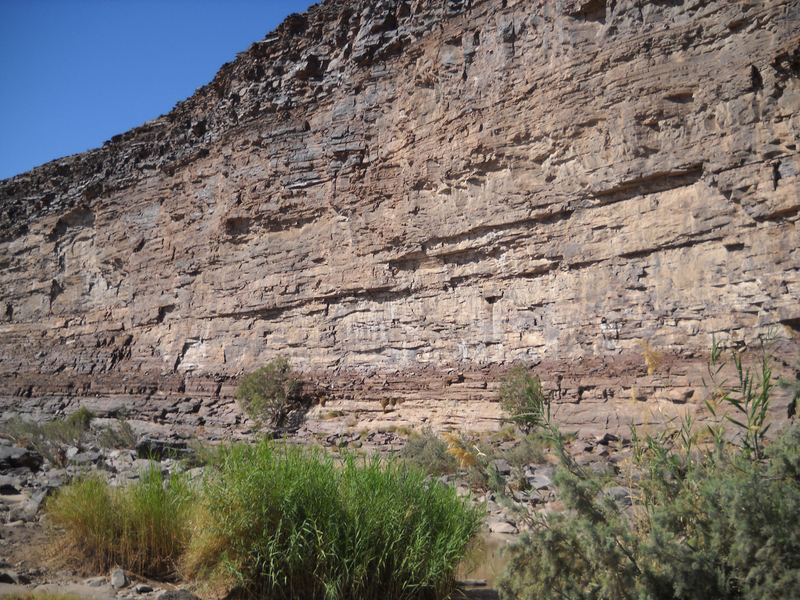 With luck we would find one of those springs and beach a Fish River Canyon monster. the odds seemed good, “Fish” is part of the name after all. 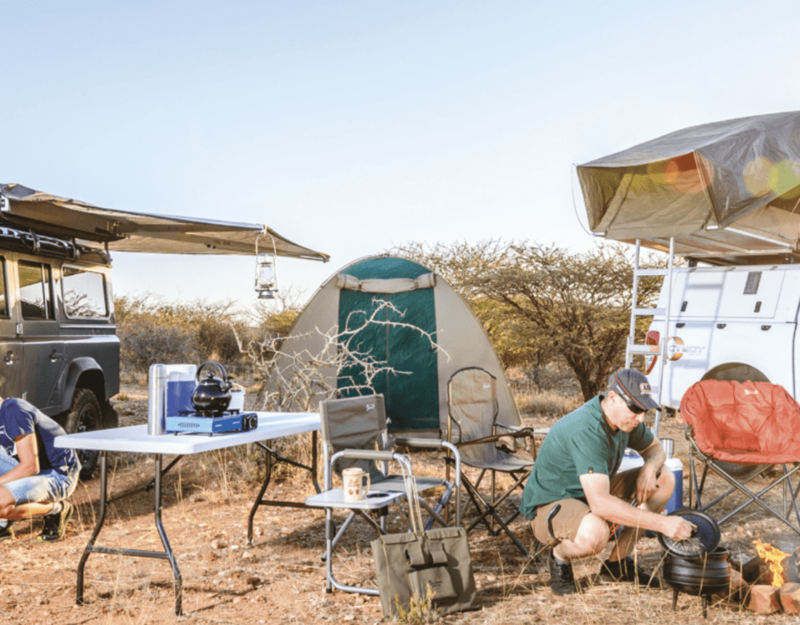 As December approached (and December days can only be described as scorching) a big cooler box filled to the brim with malt refreshments and ice was added to the packing list. Interestingly, not much else was added to this list. On an early December day Skottie pitched up at the farm with the list ticked off. Skottie, Chester and I set off on the road in a faded green Unimog, with a big blue cooler box, 2 fishing rods, 2 spare wheels (in very poor shape), 2 sleeping bags and smiles of excitement that could be seen kilometers away. We climbed off the blacktop B4 onto the D462, then hit the D463 and snaked further south. Somewhere on that road we took a left, I really don’t think I’ll be able to recognize the turn-off anymore. That is where things became fun. For the first few kilometers it was all smooth sailing, because the roads were mostly kept in reasonable condition by the farmer using the land. However, soon the conditions changed drastically. I did not adapt my driving style fast enough and the next moment I noticed that the Mog was pulling right. Sure enough, a flat tire – torn to pieces to be exact. Needless to say, after that I drove a little more carefully. 50 kilometers and 5 hours later, we spotted a little old witch’s house against the hill. I could only guess it was a witch living there because the doors were only big enough for a properly trained limbo dancer. There was a tap, in the middle of nowhere, which turned out to be a borehole which had such a huge amount of water underground that no windmill was necessary. The previous owners only capped and tapped the hole. That’s the reason I reckoned it was bewitched. I’ve never seen a borehole anywhere in Namibia that works like that, you have to beg water to allow itself to be pumped out of the ground. As we were in the middle of December during Namibian summer in the south, it got HOT and quickly too. At 7:30 the temperature outside hit 30°C! We soon realised that we travelled only 10km in an hour. Yes, that is how rough the terrain was, crawling in the lowest gear of the 72-gear ratios we battled on. Suddenly, we hit a ravine and I knew we were close. I pushed the short nose of the Mog in a direction away from the canyon and followed the broken piece of earth until it flattened out. Both of us, I mean all three, jumped out and headed down. The ground level quickly dropped as we walked and it soon became apparent that we found the legendary Donkerkloof. The name also started to make sense as there are areas where the walls of the ravine are so close together that no direct sunlight ever warms the sands underneath. The hike downward continued until the walls suddenly opened, mouthing into one of the most awe-inspiring views I have ever experienced. I realized just how small I actually am as a human being in contrast to the magnificence of nature. 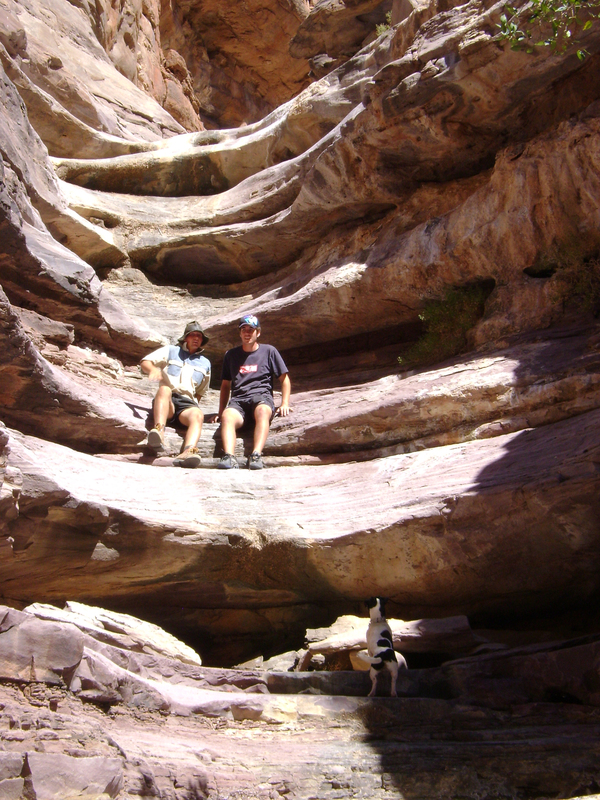 Here I was standing in the Fish River Canyon feeling like an ant looking up at some towering obstacle. Sheer cliffs that stop crisp in the clear blue sky! I woke out of my daze by the sound of Skottie’s whistle and looked at him standing next to a patch of lush greenery breaking through the grey of the surroundings. High reeds encircled a huge spring and to our amazement a fish splashed, breaking the mirror on the surface. Immediately we joined Chester already cooling off in the refreshing water. We then sped back up through Donkerkloof to get the essentials to make our camp down in the Canyon. The fishing rods were strapped on and carried down, but we may as well have left them on the plateau because only one barbel took bait on Skottie’s line. You would think that fish this far from civilization would be hungry. We spent the night taking in the surroundings. The stars shone bright making it easy to see how philosophers could get lost in thought at the sparkly blanket. The sun woke us and we hiked back up carrying everything back and leaving all as we found it hoping that the next soul to wander the canyon floor would find it as breathtaking as we did. Also, our supply of cold refreshments were running low. 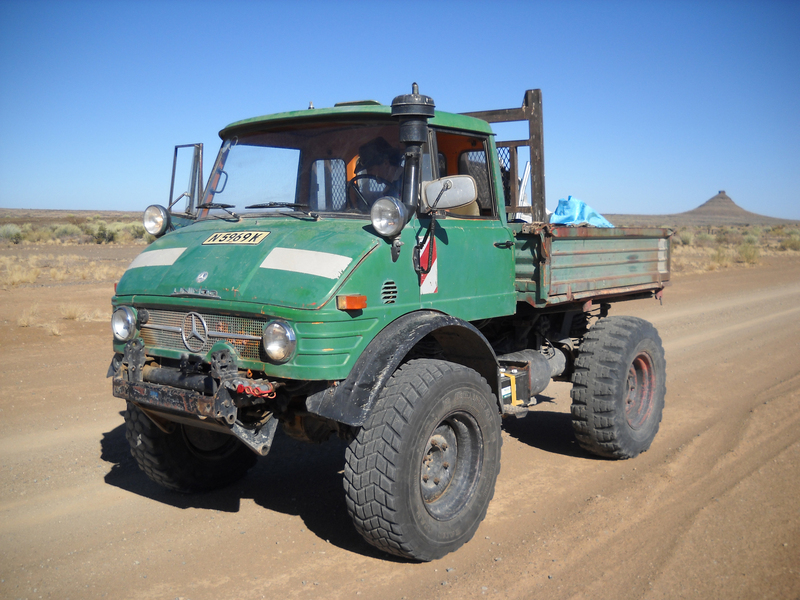 Loading the Unimog was tough as it meant having to leave behind this newfound treasure, but it also meant taking this experience and saving it in a very special place in my heart, in the spot reserved for Namibia, a spot right next to my family. This story is an account of events that took place in 2010. At that time the farms Simplon and Kesslersbrunn were under ownership of Mr Roelf Frederik Odendaal, the ownership has since changed.